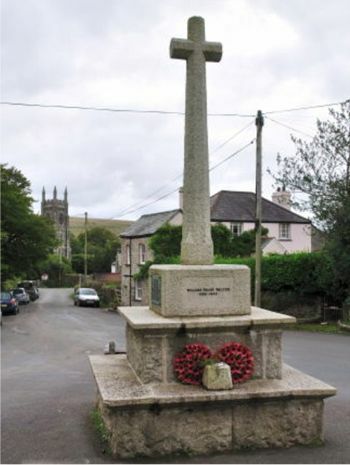 The War Memorials in North Brentor consist of a Roll of Honour handwritten on paper inside the parish church and a conspicuous stone Memorial in the centre of the village. The sole World War 2 casualty is recorded only on the stone Memorial. Live then for England - they for England died"
To these words are added the initials "A. C. A" - abbreviating the name of the author - Arthur Campbell Ainger MVO; MA. His published works mainly include school books but he wrote poetry from time to time and these words are part of a longer poem entitled "Hymn for the Royal Flying Corps" written in 1917 and published in The Times in February 1918. 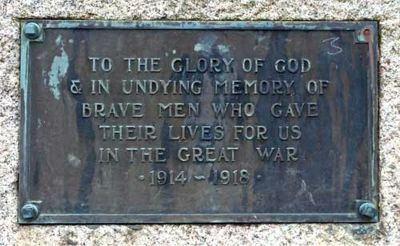 This inscription was used on many War Memorials. 51327 Private James Moore Batten of the 9th Battalion, the Devonshire Regiment. Son of James Moore Batten and Eliza Jane Batten (née Warne). Born in Mary Tavy in the March Quarter of 1889. Died 13 October 1918 aged 29. 5002 Acting Corporal John Henry Batten of the 1st/4th Battalion (Territorials), the Devonshire Regiment. 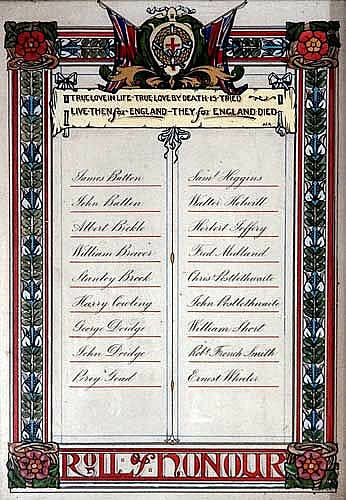 Son of William Henry and Elizabeth Ann Batten of Brinsabatch, Whitchurch. Born in Whitchurch in the September Quarter of 1896. Died 17 September 1916 in Mesopotamia aged 20. M/274278 Private Albert Bickle of 1015th Motor Transport Coy.,the Army Service Corps. Son of James and Ann Maria Bickle (née Tredennick). Born in Coryton in the June Quarter of 1887. Died 20 July 1918 aged 31. 203488 Private Stanley Brook of "D" Coy.,1st Battalion, the Devonshire Regiment. Son of the late Henry and Martha Brook of West Black Down. Born in Mary Tavy in 1899. Died 27 October 1916 aged 17. Buried in Brentor United Methodist Cemetery. 75452 Bombardier John Henry Cowling of the Royal Garrison Artillery. Son of John and Melony (sic) Cowling of West Black Down, Mary Tavy. Born in Mary Tavy in the June Quarter of 1897. Died 5 October 1918 aged 21. K/12459 Stoker 1st Class George Doidge of the Royal Navy, HMS Recruit. Son of John George and Elizabeth Jane Doidge (née Metters) of West Black Down, Brentor; brother of John (see below). Born in Brentor in the March Quarter of 1894. Died 9 August 1917 aged 23. 10134 Private John Thomas Doidge of the 8th (Service) Battalion, the Devonshire Regiment. Son of John George and Elizabeth Jane Doidge (née Metters) of West Black Down, Brentor; brother of George (see above). Born in Mary Tavy in the december Quarter of 1891. Died 10 may 1916 aged 24. 241113 Private Ernest Percy Goad of the 1st Garrison Battalion, the Devonshire Regiment; transferred as 358014 Private Goad of the 801st Area Employment Coy. Son of the late Henry Edwin Goad and Mary Jane Goad (née Palk) of Lydford, Bridestowe. Born in Lydford in the September Quarter of 1891. Died 15 November 1918 aged 27. 20914 Acting Corporal Samuel Higgins of the 1st Battalion, the Devonshire Regiment. Son of Samuel and Annie Higgins (née Westlake). Born in Lifton in the June Quarter of 1894. Died 23 April 1917 aged 22. 10261 Company Sergeant Major Walter James Holwill of the 8th Battalion, the Devonshire Regiment. Husband of Elizabeth Frances Holwill of Moor View, Brentor. Born in St Michael's Mount, Cornwall in the March Quarter of 1873. Wounded near Mametz and evacuated to England. Died of his wounds 22 July 1916 aged 43. Buried in Brentor Churchyard. Awarded the Military Cross. His citation for the Military Cross was published in the London Gazette 27 July 1916. Lieutenant Christopher Joyce Postlethwaite of the 12th Battalion, the Suffolk Regiment. Son of Doctor Frank Postlethwaite MRCS of Brentor and his wife Emma Elizabeth (née Joyce); brother of John (see below). Born in Perranporth, Cornwall in the March Quarter of 1895. Died 9 January 1918 aged 23. 336 Trooper John Joyce Postlethwaite of the 5th Australian Light Horse. Son of Doctor Frank Postlethwaite MRCS of Brentor and his wife Emma Elizabeth (née Joyce); brother of Christopher (see above). Born in Cumberland in the September Quarter of 1893. Died 2 November 1915 aged 22. 29108 Private William Short of the 14th Battalion, the Welsh Regiment. Born in the Tavistock area, enlisted in Swansea. Died 19 March 1916. Robert French Smith was the son of the Rev. Robert Joseph French Smith who was Vicar of Brentor and his wife Emma (née Marriott). His military record is not yet confirmed. 2008042 Colour Sergeant Ernest Wheeler of the Rifle brigade; formerly of the Royal Warwickshire Regiment. Son of John and Mary Wheeler of Rugby; husband of Beata Walters (formerly Wheeler, née Stratton) of Mary Tavy. Born in 1877. Died 26 February 1918 aged 41. Buried in Brentor Parish Churchyard. D/KF 580880 Stoker 2nd Class William Frank Walter of the Royal Navy, HMS Warwick. Son of Bertie and Beatrice Walter (née Colston) of West Blackdown. Born in Brentor in the December Quarter of 1925. Died 20 February 1944 aged 18.